Custom Fabricating & Supplies has multiple ways to produce your custom die cuts. 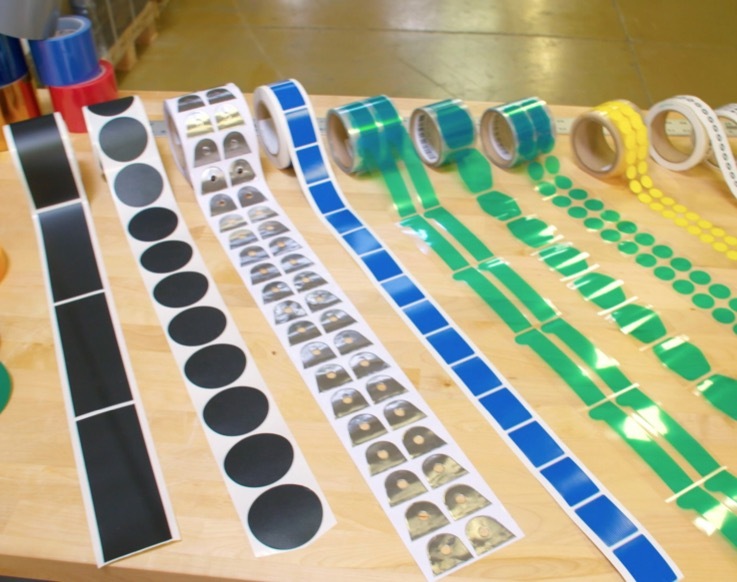 The die cutting method is determined by volume and lead time required. We utilize rotary die cutting, steel rule, dieless knife cutting, and precision die cutting. We offer low cost tooling and have the capacity to handle any size order from 100 to 10,000,000 pieces. For larger quantities, CFS recommends rotary die cutting. The one-time setup charge is higher than steel rule but the savings is in the per piece prices. CFS can easily produce more parts in less time with Rotary die cutting than by any other method. We can produce these parts on rolls, individual pieces or in sheets. Rotary die cutting yields a level of uniformity in final product that is almost unmatched. Speed is also an advantage of rotary die cutting. These machines can run hundreds of feet of material per minute, rotary die cutting offers considerable production efficiencies. This process is ideal for “Kiss-cutting”. The cost of rotary die cutting is often less than other forms of cutting. 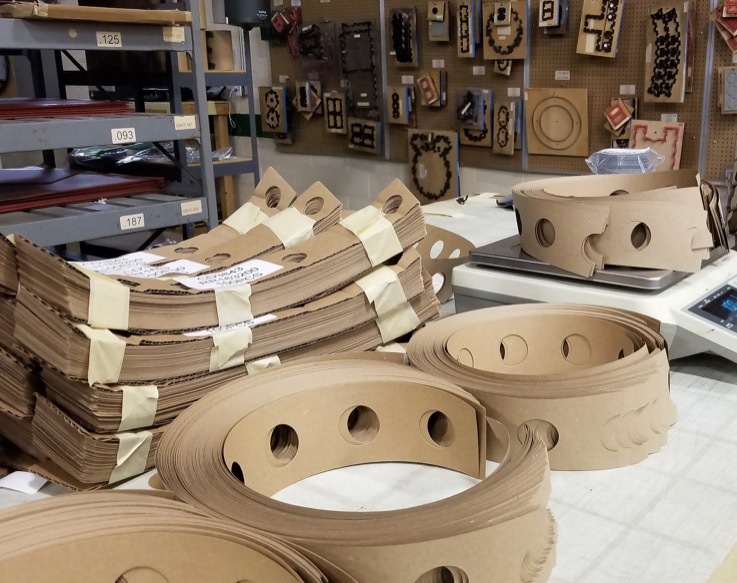 One of the reasons is because other production methods may require multiple operations where rotary die cutting can perform all the operations in line, saving time and money. Rotary die cutting has many more size limitations than other methods of cutting. The length, height, and width are all subject to the limitation of the rotary machine. Other forms of cutting allow for bigger finished products (such as dieless knife cutting and steel rule). Rotary die cutting is not the method of choice for thicker materials, low volume or high die cutting tonnage requirements. The rotary tooling can also be more expensive than other conventional die cutting options. Steel rule die cutting uses a custom steel tool to punch a shape into a flat material. Three components are involved: a cutting edge, a die board and a rubber ejector. The die board is a flat surface, which has a thin groove the shape of the desired part cut into it, usually by a laser. The cutting edge — a thin metal blade — is bent into shape and placed onto the die board, where it is overlaid with a rubber ejector material. Operating the die involves feeding a material in and stamping the tool into it with a heavy tonnage press. This causes the material to break along the cutting edge. Then, the rubber ejector pushes the cut part out of the steel die. Steel rule dies can also be equipped with a creasing tool which, rather than completely severing the material, cuts part way through it, creating a crease, or perforation. The main advantages of steel rule die cutting are accuracy, simplicity and low tooling costs. The process creates clean cuts on appropriate materials. 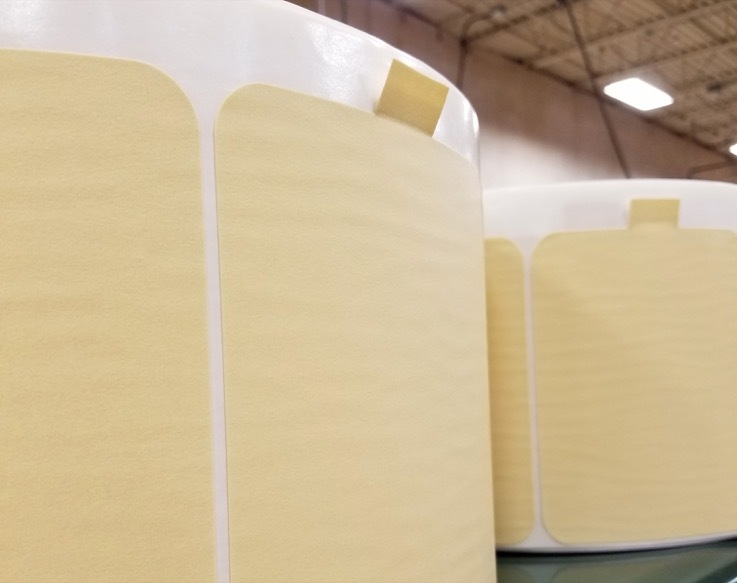 Foam, cardboard, cork, rubber and plastic are ideal materials used to produce gaskets, electrical insulating components and foam inserts. These items can be produced with a high degree of consistency and repeatability. These components can be found in electronics, LED lighting, enclosures, plumbing and HVAC equipment. Occasionally unavoidable surface and cut edge effects may limit the viability in materials. The most common of these are concave/convex edges or hourglass effect. This is caused by the compression and extrusion of material as the die impression is stamped, especially on rubber and closed-cell sponge materials. The material flows under the pressure of the force of the die before and during the cutting cycle. The die cuts straight through, but the momentary shift and subsequent recovery of the material once the part is ejected from the die leaves a concave rather than straight edge on a cross-sectional view of certain materials. The hourglass effect increases with the softness and thickness of elastomeric materials. Our custom die cut components are used in the electronics, automotive, medical, finishing, military and aerospace industries. We can expedite samples of custom die cuts within 24 hours and can produce and ship small runs the very same day. To speak to an experienced representative, contact us today. We would be happy to prepare a detailed quote for your specific needs.